This article is by Wendell Kim -- Long time San Francisco Giant coach. We have all seen the televised games where the announcer says: "And the hitter looks down to third base for the signs from Wendell Kim." Coach Kim offers a game day preparation list that is valuable to all players and coaches. 1968 Graduate of Banning High School in Wilmington California. Played four years of varsity baseball at Cal Poly, Pomona. Was twice named to the All-California Collegiate Athletic Association team. Began coaching career with Shreveport (AA) as a coach and went on to manage eight years in the San Francisco Giants Organization. Promoted to the major leagues in 1989 as the San Francisco Giants 1st Base Coach. In 1992, he took over duties as the Giants 3rd Base Coach. After 24 years in the Giants organization, WK began the 1997 season as the 3rd Base Coach for the Boston Red Sox. 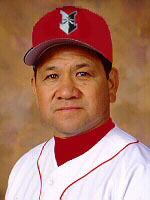 On November 29, 2000, Wendell Kim was named the manager of the Indianapolis Indians of the International League. The Indians serve as the AAA affiliate of the Milwaukee Brewers. What is the count on the hitter? Who are the possible pinch-hitters, pinch-runners, relief pitchers, etc.? Have the pitcher's jacket or glove ready. Always have your own equipment ready. Try to determine what the pitcher is doing. What is his best pitch? What is he having trouble getting over the plate? What does he throw in different situations? What is he throwing to certain hitters? What kind of hitters are they? What do they have trouble with? What do they handle best? Try to pick up pitches and signs from the other team. Check out the coaches, pitchers, and catchers. Observe the pitcher in the stretch to see if you can run on him/her. Look at body and leg movement. Look at head movement and shoulder turns. How fast is his move to first base? Check to see if you can steal off the catcher. Does he have a weak arm and are the throws accurate? Does he have trouble handling the pitches? Is a delayed steal possible; is the catcher paying attention? Develop a hitting plan in the dugout. What velocity is the pitcher throwing? What does the hitting situation call for you to do (bunt, swing away, hit to right, take, etc.)? Get yourself into a hitting rhythm with the pitcher's motion. Do not "get on" the other team. There is enough to do without "popping off" to the other team. Show class at all times. Always hustle in and out of the dugout. Reassure your game plan for hitting. Check the pitcher again and see if your hitting plan is correct. If not, develop a new hitting plan quickly. Get a real good look at the pitcher's stuff. Get into a rhythm with the pitcher. Swing as if you were at the plate. Swing at the speed you plan to hit. Take a pitch at the speed you are planning to hit. Where are they playing (too deep, too shallow, etc.)? Can you bunt on the pitcher, the first baseman, or the third baseman? Does the pitcher quick pitch - be aware before you step in! Look for the signs right after each pitch. Give a return if called for. If not sure of a sign, pick at your shirt to alert the coach. Once you have stepped into the batter's box, think only about what you are going to do - hit the ball. On a pick-off attempt, step out of the batter's box. On wild pitches and passed balls, help any baserunners. On a steal or hit and run, protect the runners. On a steal, hit it if it is a good pitch. On a steal, swing at a pitch out of the strike zone if you think it will give the catcher trouble. On a hit and run, you MUST swing. With two strikes, shorten your swing in order to make contact. If your mind starts to wander, step out of the box and re-establish your hitting plan. Sprint to first base on all walks. On ground balls to the infield, glance at the ball so you can see if a throw will be bad or if you may need to slide. Every hit is a double to you - make the outfielders stop you. Round first under a controlled speed. Sprint to second if the outfielder is slow getting to the ball or if he/she bobbles it. Always touch first base - touch the front half of the bag to the middle. On overthrows, do not go to second base unless you know where the ball is. The fielder has the right-of-way on all pop ups. Be aware on base hits through the infield. Angle out right from home plate. Take a good sharp turn around first base. Round the bag under a controlled speed. Look for a high or bad relay throw and if so, head to second. If you hesitate, go back to first. Once you round the bag, you are on your own. You are the best judge of how you can run. You know best if you can make it to second base. Check the position of infielders and outfielders. Take the same type of lead every time so as not to tip off a steal or a hit and run. On all bases, take a safe lead that is not too short too help avoid the double play. With two outs, you can take a bigger lead after each pitch. Observe the pitcher in the stretch to help with a steal or hit and run play. Look for the delayed steal situation. Always anticipate a wild pitch or a passed ball. On a base hit, watch the ball and make the decision yourself whether you can go to third. Only look for the coach if you cannot see the ball. On a batted ball down either line, you should be able to make third base without a problem. If you hesitate, do not go to third base. In a double play situation, do not let the second baseman tag you. Try to break up all double plays. If the first baseman does not hold you on, steal (unless you are very slow afoot). In a stealing situation, do not go if you do not have a good jump. In a hit and run situation, you must always run as soon as you see the pitcher make a move toward home plate. On a passed ball or wild pitch, you can only go if the runner in front of you goes. On a bunt, run when you see the ball head toward the ground. With one out or less, take a step back to the bag on any line drive or ball hit in the air. Take a lead off the base about two to three feet back toward the shortstop. Your secondary lead is very important after the pitcher's release. When the ball is caught, take a step back toward the base and know where the ball is. With one out or less, any ball hit by the pitcher and to your left means you should go to third. With one out or less, any ball hit by the pitcher and to your right means wait for the throw to first before attempting to go to third. Exception #1 - Go ahead to third if it is a high hopper or a slow roller. Exception #2 - Go ahead to third if the third baseman makes the play out of position. Look for the hit and run situation. Make sure the pitcher pays attention to you. You may be able to steal third. On a base hit, always assume you will be trying to score. Stop only if the coach stops you. Look for the coach before and after hitting third base. If held up, get back to the bag as quickly as possible. Anticipate a wild pitch or passed ball. Take a short walking lead in foul ground. With one out or less, take a step back on a line drive or fly ball. Always tag up on a fly ball. With one out, you try to score on a ground ball. Look for the ball to hit the ground between home and the pitcher's mound. If it appears you are out at home by a lot, get yourself into a rundown so the other runner(s) can move up. Try to score in a double play situation. On a bush or delayed steal, move into fair ground as the catcher receives the ball. Depth perception is poor for the catcher. It will be a harder catch for the third baseman to make on a throw from the catcher. Slide anytime there is a throw made when you are trying to score. Know when to go home on a squeeze play. Take a short walking lead. Break hard as the pitcher's front foot hits the ground. Know when to go home on a bush play. With a left-handed pitcher, you leave for home first. With a right-handed pitcher, the runner a first base leaves first. Know when to go home on the delayed steal. The coach will tell you to stay or go. If you are going, leave as the catcher releases the ball. If you are staying, be sure to give a good bluff. Make sure you touch home plate. Never slide headfirst into home plate. Meet to find out about practice or the next game. Help gather and carry equipment to storage. Hang your uniform up on a hangar. Play the games one at a time. Don't dwell on the past or look into the future too much.